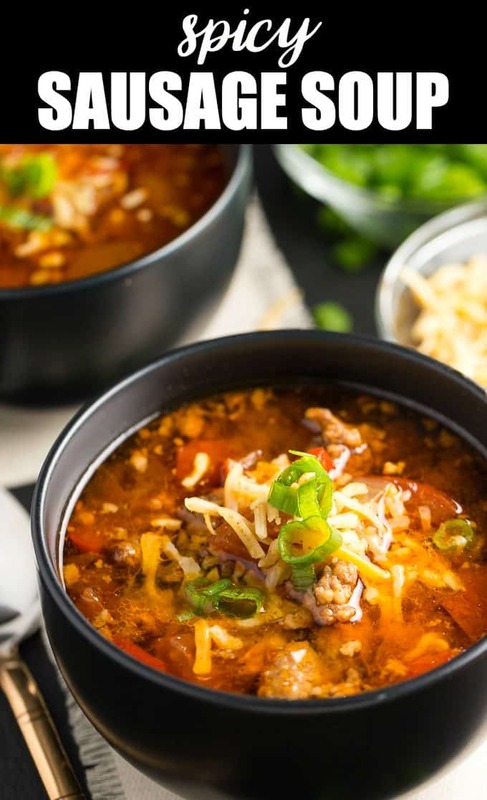 Add this Spicy Sausage Soup recipe to your meal plan for this next week. A slow cooker sausage soup that is loaded with garlic, onion, spicy Italian sausage in a beefy broth. Pair with a side of cornbread and serve this up to take the chill off a cold winter day. Last week I made Sausage Jambalaya and had been craving sausage since. I decided to see how it would taste in the soup. It was tasty but spicy! It is one of those types of soup that keeps you diving in for one more spoonful. Plus the leftovers taste pretty fantastic as well, which I can’t complain about. In the winter soup is on our menu a LOT! In Canada it is cold, and it feels like winter drags on forever. Having slow cooker soups to prep and start in the morning is excellent. I can go about my day and then have a hearty dinner to serve up when it comes time. I buy hot Italian Sausage that is in casings for my Spicy Sausage Soup. Then just slice the casing off with a sharp nice and pull out all the sausage and cook it up in crumbles. I find that sausage in casings offers a more rich flavor. And it cooks up nice, I just use a chopper and cook it like ground beef, and then dump into my slow cooker. If you can’t handle the heat, that is okay. Just reach for a mild or medium Italian sausage instead of hot. Depending on who I am serving it to will depend on the heat factor I want. My daughter prefers the mild sausage as the hot is too spicy for her liking. 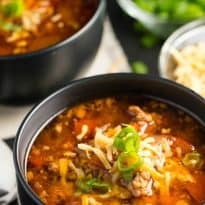 This Spicy Sausage Soup is so easy to follow, and within a few steps, you have it cooking away. Just start by cooking up your sausage, onion, and garlic on the stove top. Make sure to cook until all the sausage is no longer pink and onions and garlic are tender. Put in the slow cooker, and the top with the remaining ingredients. Give a quick stir, cover and cook on low for 7-8 hours. If you don’t want to use Italian sausage for the Spicy Sausage Soup, you can replace with smoked sausage. It will vary in the flavor, but if you buy a hotter style sausage, it will still pack some heat. Sandwich | I sometimes will whip up a half of a sandwich for each person. I find that ham or even salami and pepperoni together work well next to the soup. Toss on your favorite condiments, lettuce, cheese, tomatoes, and slice and serve. I make one mean grilled cheese sandwich. Bread | Sometimes I will make a homemade bread to slice and serve along with it. This is great for dipping into the savory broth of the soup and getting all that added flavor to the bread. Cornbread | Similar to bread but the corn paired next to the sausage is just magical you guys. Salad | Or if you are on the hunt for a lighter side make a homemade salad and pair it with your soup. The added crunch of the salad will compliment the tender and savory sausage soup. Or sometimes we just eat it with crackers, and that is it. This soup is outstanding on its own and doesn’t need anything to accompany it. Yes, you can quickly freeze your sausage soup. Just allow it to cool and place in a freezer sealable bag or toss in a container that is freezer safe. Freeze up to 3 months. Just thaw in the fridge the night before you want to serve it. Then warm up on the stove, slow cooker, or even in the microwave. As you can see this spicy sausage soup is one satisfying bowl of goodness. Give my recipe a try the next time you want a little spice in a warm soup base! Have you ever tried a Spicy Sausage Soup? Filled with hot Italian sausage, red peppers and tomatoes. This soup packs a powerful flavour punch! Fry first three ingredients in a large frying pan over medium heat for about 8 to 10 minutes or until sausage is no longer pink. Drain the fat. Transfer to a slow cooker. Add remaining ingredients to the slow cooker. Stir. Cook covered on Low for 7 to 8 hours. This one is a keeper- pinning! Taco Soup & THIS??!! Yumm … pinned for future! the picture made me hungry – the ingredients made me want to make it – Would love it if you shared on our What’s for Dinner Sunday link up! I definitely need to try this soup! Yum! Thank you for sharing at Merry Monday. This looks perfect for a winter day! Thanks for linking up with Funtastic Friday! I think I’m about to eat my screen right now Stacie. Your sausage soup sounds so hearty and delicious, the prefect meal for a cold Winter evening. Hi Stacie! 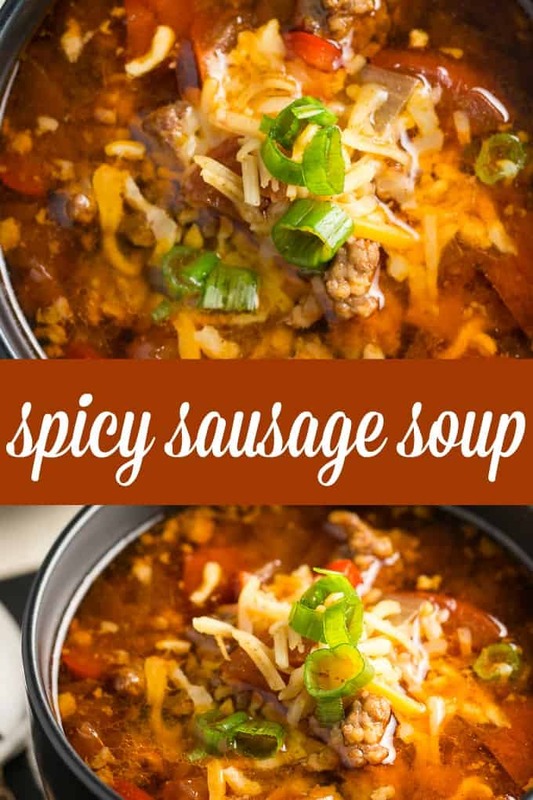 This spicy sausage soup looks delicious 🙂 Thank you so much for sharing with us at Dishing It & Digging It & congratulations on being featured this week! From this picture this soup looks delicious and from the ingredients this soup sounds delicious and that’s why I’ve printed the recipe and I’ve also pinned it to one of my recipe boards. Making it right now. I am going to bake some brown rice to accompany it.